I used to almost always get 2 rear tires out of a front. This one only went about 1.25 rears, maybe 2500 miles. Stopped on the Blue Ridge Parkway and I could see a stripe of lighter colored rubber, came straight home taking it as easy as I could on right handers. This is what it looked like by the time I got it in my driveway. What brand/type of tire do you run and what pressures? I ride way harder on the street than I should and am getting over 4k on my Shinko Verge rear tire, 500 miles or so longer on a front. I generally set my pressures at 32 psi frt and 34 rear, provides a quick enough warm up without getting too hot. The Michelin Pilot Roads (3 and 4) weren't even lasting that much and I was paying over 150 bucks more a set, grip level is easily the same in the dry. This is my current Verge at about 4k, getting within 500 miles of being completely bald in the center. Last edited by Bryanc123; 09-03-2018 at 01:56 PM. 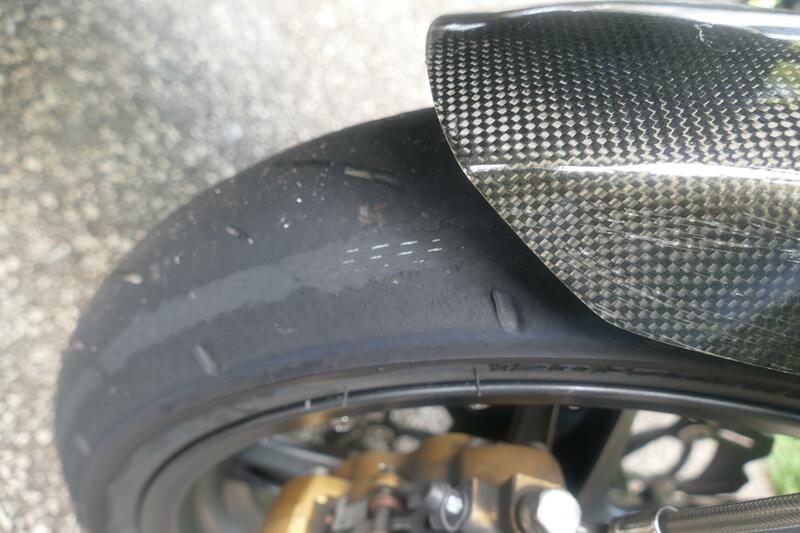 That's a Bridgestone S20. I run about 2 psi higher than your pressures but I'm pretty heavy. Everything I ride is twisties. I've only tried one sport touring tire like the Shinko Verge, it was a Bridgestone BT023 and was the most disappointing tire I've tried on the S3. It got hot and greasy and wore out faster than a super sport tire. No more sport touring tires for me. The nice thing about the Verge tires is they're kinda of in between a sport touring tire and a typical name brand sport touring tire. Compound is long lasting like a sport touring tire, but without all the sipping grooves that they have. As a result, it's not so hot in the rain, but the grip in the dry is actually better than the Pilot Roads and it doesn't tear up like the sport touring tires tend to when pushed consistently hard. In my neck of the woods, highway 12 is the hot place to take a sportbike. Over 50 miles of twisties consisting of pretty much every corner imaginable. I've gone up and down the whole distance of that road 100+ miles at a knee dragging pace with consistently good traction the entire time. Pretty amazing for a tire that lasts over 4k, not too mention the fact they're dirt cheap. Steep front tire profile that tends to fall in quickly takes a bit of an adjustment period, but It didn't take long before I unconsciously compensated by giving a lighter input to the bar and a slightly later initial turn in. The first handful of corners I found myself having to pick the bike back up mid corner. As quickly as you go through tires, it couldn't hurt to give them a shot. Nevertheless, with your prior sport touring tire experience I can see why you'd be hesitant. 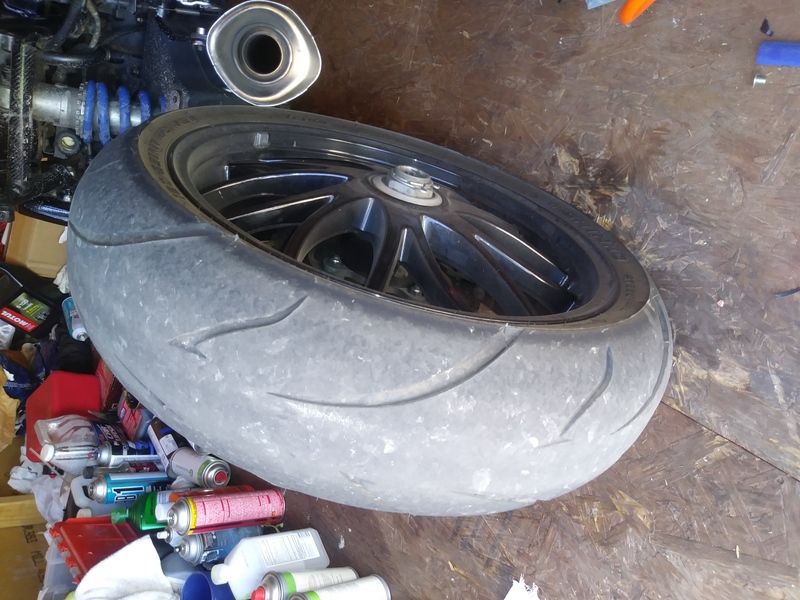 I ounce ran a Michelin Pilot Power tire on the front of my speedie, gripped really well, but lasted less than 3k miles, I typically get about 5k out of a front Shinko. Last edited by Bryanc123; 09-06-2018 at 04:40 PM. I have found personally my tire wear is directly related to the type of chainlube I run. And kratom has killed 45 people single handedly, or is it 46 now? I drank 46 beers on Kratom one time.. Impressive. I swear by the stuff. One of the few things that I've found to be enjoyable, but also be good for my life. Has for the last 4 years given me a inner sense of balance I've been chasing my whole adult life. The BS propaganda that the FDA and the DEA puts out there and gets the mass media to buy into pisses me off to no end. Linking deaths to kratom due to the fact it was one of several things in a persons system is absurd. If more people knew the truth about the stuff it would have a much better chance of staying legal. I'm the type person that will shout off a roof top for things that have done well by me and exceeded all expectations. Shinko Verge tires and Kratom! For anyone wanting to see a true no BS documentary about kratom, I highly recommend watching "Leaf of Faith" on Netflix! Ok, I'm done ranting now. Last edited by Bryanc123; 09-08-2018 at 12:47 AM.